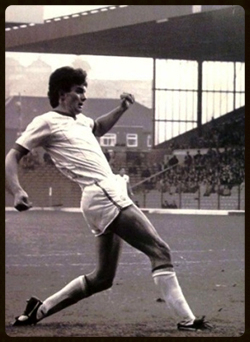 You may not remember Steve Balcombe playing for Leeds United; after all he made only two first team appearances. However, on the 3rd of October 1981 the League Champions, Aston Villa, came to LS11. In their ranks was a certain Brendon Ormsby. I know for a fact that Brendon will always remember Steve Balcombe. "I played for Ireland U15s in Holland which resulted in calls from Ajax who were interested in signing me". "I loved going there but it was agony after each spell. Once I returned to Ireland I would have to wait for a letter inviting me to go back or a letter advising me that they'd seen enough and I was no longer needed." "It wasn't easy, I had moved from a different country and I had to adjust quickly. The digs were two bus rides from Elland Road so I was happy when I eventually moved to Middleton which is a bit closer. "We had some great lads in the youth system, John Lukic, David Seaman, Terry Connor, Martin Dickinson and Aidan Butterworth to name a few. Leeds had a fantastic youth policy." "We flew down there and it was my first experience of being involved with the first team. I was extremely nervous and although I didn't get on the field, we won 2-1 and the win bonus came in very handy!" "I trained with the reserves and juniors the day before and as we were walking off Fullerton Park the manager called me over and told me he wanted me to train with the first team. "Later on when the team sheets were pinned to the board, I had been named in the first team squad for the following day's game with Aston Villa. "We had dinner at the ground on the Saturday and at 1:45 I was in the dressing room. Barry Murphy handed me a shirt which was all nicely folded. When I unravelled it, it was the number nine shirt. I couldn't believe it and it was at that point that I realised adrenaline was brown!" It was an emotional moment for the youngster, a childhood dream was about to come true. Steve Balcombe's time had come. "We were a goal down and in the second half we attacked the Kop. Villa centre back Allan Evans inadvertently headed the ball into my path and as Brendon Ormsby came across I flicked it over his head, chested it down and stuck it into the net past Jimmy Rimmer." John Helm described it as a dream start staright out of a story book and one of the Sunday newspapers described it as an "embryo Pele!!" Should a goal of similar quality be scored in the Premier League today, it would be shown all across the world, every hour of every day for a long time. "I almost scored a second soon after the equaliser when I got on the end of Arthur Graham's cross but Jimmy Rimmer clawed the ball out from underneath his crossbar." "We lost 1-0 but again, I thought I did well. I was the victim of a hefty challenge on the halfway line and despite feeling the effects, I was able to continue." "If I had stayed fit I was sure I would have been in the squad for the next game which was against Liverpool and Ronnie Whelan. "I fought my way back to fitness and was named in the squad to face Manchester City at home but unfortunately the game was postponed". "It wasn't a great time to be honest. There was unrest in the boardroom and it filtered right through the club down to the cleaning ladies. I wasn't getting a game and my contract was due to expire at the end of the season." "After the final training session of the season the lads who were out of contract were sitting in the away team dressing room waiting for the call to go and see Allan Clarke in his office. Lads were coming out in tears having been told that was it and they were on their way out. "Martin Wilkinson, Clarke's assistant, had told me that I would be alright; a contract was on the table for me to stay at Elland Road. As I entered the room, he stood there with his head down, he never spoke to me." Allan Clarke informed Steve that he would be letting him go. Steve argued that Wilkinson had told him that he'd be offered a deal but Clarke made it clear that he was the decision maker. "There was interest from Bristol Rovers and Chesterfield but my desire had gone. I decided to go back to Dublin and I had spells with Home Farm, Dundalk, Shamrock Rovers and Oaklands. Trying to get a job was a nightmare and I would urge all young, starry eyed players to concentrate on their education." In 1985 Steve moved back to Yorkshire and played briefly for Whitby Town who were managed by David Harvey. The team at Whitby included Eddie Gray and Ray Hankin. He continued from there with spells at Harrogate Town, Tadcaster Albion and finally Boroughbridge, scoring the winner in the County Cup final. "I absolutely love what I am doing now and I wouldn't change a thing". 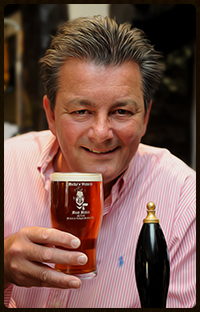 Nip in to The Victoria, have a pint of Balky's best bitter and a meal and ask Steve about that goal that had John Helm purring and Brendon Ormsby wondering what day it was! Thank you to Steve Balcombe for giving me his time and the opportunity to write this article.